Can you imagine the convenience of that? First, you’re saving your customer time because they don’t have to search for the coupons and then you’re saving them time because they don’t have to print the coupon. It doesn’t get any easier and it will make your customers feel privileged as a regular customer at your restaurant! Keep them coming back in and help them save a little while you’re at it. They’re going to love it. Your restaurant mobile marketing strategy should definitely include mobile coupons, as well as a mobile website, SMS marketing and use of QR codes. A mobile website is especially helpful for restaurants that are new (or newer than the others in their area). 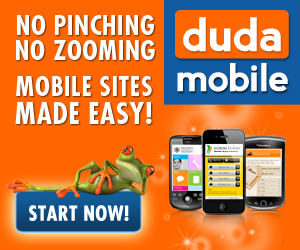 A mobile website will allow your potential customers to find you online and then come and see you for lunch! A lot of people don’t have time to really search out new restaurants and try to find new places to go; so they just eat what they’re used to. With a mobile website, those customers who choose where they’re going last minute by looking at a mobile app on their way home will now be able to access your information and come see you today! A mobile website will give you the upper hand on your competitors and it will really put you in the game! SMS marketing is one of the newest growing features of mobile marketing. With SMS marketing you’re able to text your entire contact list at one time and invite them in for a special that you have going on ‘today only’ or whatever else you’d like to advertise. With SMS marketing you will come up with your mobile coupons and send them out to your customers through bulk text messaging or SMS messaging. Your life is going to become much easier once you’ve begun this, because you’ll no longer have to worry about your advertising; you’ll be doing it right from the palm of your hand! check out our Tatango Reviews to learn more about sms marketing. QR codes are much like bar codes in appearance, but they hold tons more information than bar codes! QR codes allow you to transmit the information you want to send very quickly as the QR code actually takes up very little space. With QR codes, you can utilize your restaurant mobile coupons, you can use your mobile website and of course you send it through your SMS marketing software. QR codes allow you to put any information into your text message that you’d like and when they click the QR code it links your customers directly to whatever you want them to see. How easy is that?? Now you see how amazing restaurant mobile coupons are in Las Vegas, and how easy mobile marketing can be; are you wondering how to get started? Of course you are!! Trumpia is our #1 choice for mobile marketing services! Trumpia will help you with all of your questions and concerns and help you solidify your mobile marketing strategy in a snap! Go now and take advantage of their free trial! You’ll be so glad you did! There are quite a few of Mobile Marketing Firms in Las Vegas Nevada, but before you decide on a mobile marketing strategy, Sign up for our FREE mobile marketing training below. There is no doubt that mobile phone marketing is the new future of marketing. As a restaurant owner in Las Vegas Nevada, you need to start to learn more about how these new mobile marketing solutions will help your organization. If you own a restaurant in Las Vegas, take advantage of our FREE VEGAS MOBILE MARKETING TRAINING VIDEOS by Signing up Below!